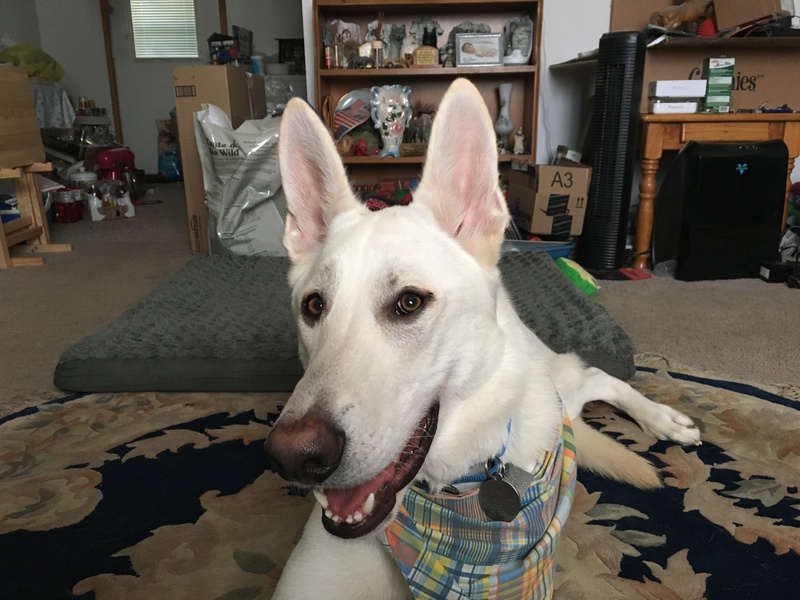 Sam is a two-year-old German Shepherd who doesn’t always listen to his guardians, barks at arriving guests and people he doesn’t know; especially children or individuals with disabilities. I was really happy that I was able to work with Sam. I briefly met his guardian at one of the dog behavior workshops I gave at Dogtopia (A fantastic dog day care facility in Omaha) a month or so ago. Unfortunately a couple of little ladies in the front of the room monopolized the Q&A part of the workshop and Sam’s guardian was not able to ask any questions for herself. Knowing that the dog was reactive to strangers, I prepared myself by rubbing a high-value treat on my shoes and the shins of my pant legs. Additionally I had three high-value treats in my hand to give to the dog as soon as the door opened. Fortunately my strategy worked perfectly. After smelling the treats he went directly to my hand to retrieve them. Right after he did, he went down to my shins and started sniffing them as well as my shoes where I had rubbed the high-value treat. Obviously this is not a practical solution for Sam’s problem, but it did give me the ability to come into the room and start working with him without having to worry about him settling down or learning to trust me. To be brutally honest, I was a little bit concerned for the situation because Sam’s guardian had used a walker when she attended my workshop. Although he’s not a super high energy dog, any two-year-old is going to need a considerable amount (45 minutes or more) of daily exercise to prevent them from developing behavioral issues. But Sam’s guardian had really gone above and beyond to make sure that he was getting as much exercise as she could arrange. She took him to Dogtopia a couple of days a week. But I could tell that Sam definitely had some excess energy so I made a few suggestions, going over some creative ways that she could burn the dog’s energy. I always tell my clients, your dog’s energy is going to come out somewhere, either you can decide where it comes out or the dog can decide. As we were wrapping up the discussion of exercise, I noticed Sam invading the personal space of his guardian and myself multiple times. It didn’t take long to determine why he was doing this, each time that he did, the guardian reached over and started to pet him. While petting a dog is a great activity, I frequently see dog guardians providing attention or affection at the wrong times. If a dog is in an excited or unbalanced state of mind and you present them with attention or affection, you are agreeing with whatever the dog happens to be doing at the time. In this case, Sam’s guardian was reinforcing or rewarding him for invading her space or nudging her for attention. To change Sam’s thinking that he could demand attention whenever he wanted, I went over a technique that I like to call Petting with a purpose. Asking a dog to sit, lay down or recall before we provide it with attention or affection is a habit that generally takes humans about a week to adopt. It will be really important that both of Sam’s guardians practice this technique in order for it to become effective. If both guardians do adopt the technique, each time that they ask Sam to do something for them before they pet him, they will be developing a healthy leader follower dynamic that will help alleviate many of Sams unwanted actions and behaviors. Sams other guardian arrived shortly after we finished filming the petting with a purpose video. I spent a few minutes discussing the situation with the other guardian and offered him some suggestions that will also assist them in modifying Sam’s unwanted behaviors. While it may seem like a small thing, making the dog get permission before it jumps up in bed or on furniture can go a long ways towards helping the dog see the humans as having more rank or status. It’s also going to be important that the guardians do not allow Sam to assume an authoritative posture such as standing over them, placing his paw on their arms when petting him or feeding him from their plates. These behaviors can easily confuse a dog into thinking that it has more authority than it actually does. Usually when I have a client whose dog exhibits the same unwanted behaviors as Sam’s, it’s a result of the way that the guardians are interacting with the dog. It’s extremely important that any large breed dog has a healthy respect for the guardians as it’s authority figure. If this respect is not developed sufficiently, then the dog will usually only listen to the humans when it feels inclined to do so. Though he does not appear to be an aggressive dog, his initial reaction at the door can absolutely be interpreted by a human as something to be concerned of. If the dog is excited and a human opens the door then attempts to run away, this can easily trigger a chase response in the dog that can result in a very unpleasant situation for everyone. Usually I would show my clients how to use their body position and movement to move the dog away from the door before opening it. But because Sam’s guardians had some mobility issues, I decided a better course of action would be to condition the dog to go to a specific location across the room. After showing the guardians how to condition the dog to go to this location on command, I used some counterconditioning to change the dog’s reaction to a knock at the door or ring of the doorbell. I was quite pleased at how quickly Sam responded to the counterconditioning. Now there are two scenarios in which a dog reacts to something; cold and warm. When you repeat something over and over this is consider doing it warm. It’s easier for dogs to adjust their behavior once they are warmed up. In order to help Sam adopt the same behavior in a cold situation, is guardians are going to need to practice the counterconditioning exercise one or more times a day, every day for the next 1 to 2 weeks. If done properly, Sam will learn to get up and move to the location across the room when he hears a knock at the door or a doorbell ring rather than barking and rushing the door. I spent the next few minutes explaining how Sam’s guardians can apply the same counterconditioning technique to the sight of children or disabled individuals outside of the home. I recommended that they incorporate a leash that is tethered to a tree or solid fence post while they countercondition Sam just to make sure that everyone stays safe. When we were wrapping up the session, one of Sam’s guardians mentioned that the dogs seemed much calmer to him. I also noticed that Sam seemed to be following their commands better while also showing some respect for their personal space rather than nudging or pawing at them for attention. I think increasing Sam’s daily exercise will go a long ways towards reducing his reactivity to the door. Combined with regular enforcement of the new rules, petting with a purpose and counterconditioning – the knock or ring of the doorbell should start to result in a non-excited response from Sam. Because Sam is such a smart dog and his guardians are so determined to fix his behavior problems, I’m guessing that it shouldn’t take longer than a couple of weeks before Sam no longer reacts to the door. Once that’s the case, then his guardians can start to apply the counterconditioning technique to other situations that trigger a response from him such as children or individuals with disabilities. With a little time and practice, Sam will learn to actually look forward to those encounters.